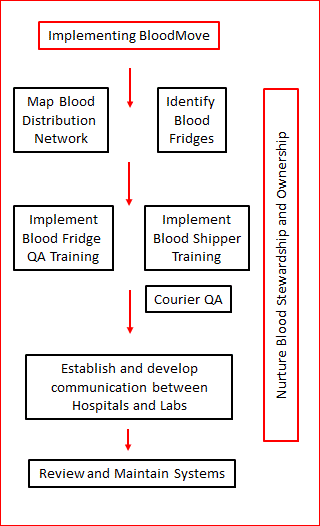 The image above demonstrates how the BloodMove process in South Australia involves partnering regional hospitals with regional and metropolitan laboratories (BloodMove Country). The laboratories supply emergency and cross-matched blood to these hospitals and any unused blood is returned to the laboratories. If necessary, regional laboratories may transfer their near-expiry blood to the central metropolitan laboratories for use. 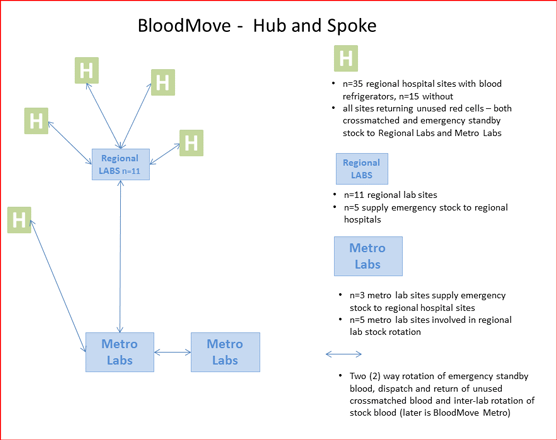 Smaller metropolitan laboratories (private and public) may also transfer near-expiry blood to larger metropolitan laboratories (BloodMove Metro) for use. 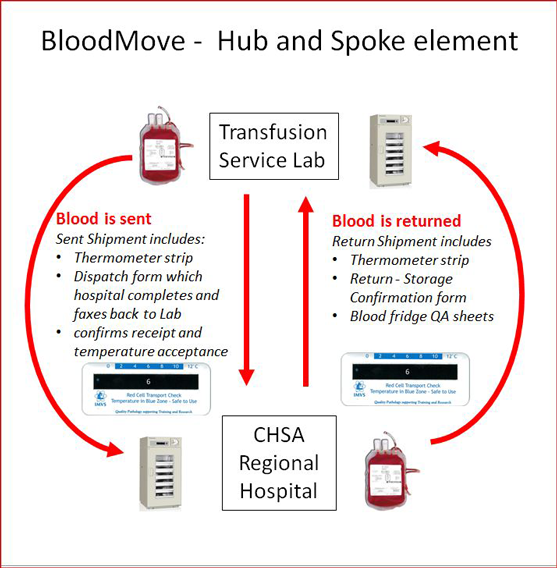 As depicted above, a transfusion service laboratory sends a shipment of either cross-matched or emergency standby blood to a CHSA regional hospital, which includes a thermometer and documentation. The receiving hospital verifies blood temperature on receipt, completes documentation and faxes it to the dispatching laboratory. 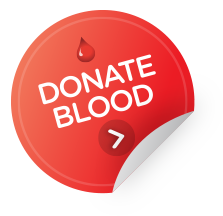 If blood is not used or if the emergency standby blood approaches 10 days to expiry, it is returned to the dispatching laboratory. The return shipment includes a thermometer and the hospital’s storage quality assurance documentation. This documentation includes a red cell return form which acts as confirmation that the blood was stored and handled correctly during its ‘stay’ at the hospital and copies of the blood fridge maintenance record form(s) and thermograph(s), which act as evidence.